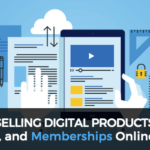 Read Part One of our series on selling digital products, online courses and memberships. Products, course, and memberships are a great way for coaches to make passive income while also improving relationships with clients. 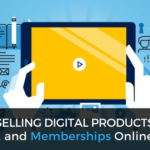 Through selling online pre-packaged materials, clients can get more access to your information without you needing to put in any additional work. These smaller items can help new customers get a taste of your coaching business before committing to being a full client, while also giving clients some supplemental content to keep them engaged. However, in order to efficiently sell these courses, products, or memberships, you need strong landing pages. Landing pages give your customers a run down of everything you have to offer. From course or product details to testimonials and pricing overviews, a landing page acts as a one-sheet sales guide to help encourage clients to convert. But your landing pages need to be visually appealing. A landing page is often the last piece of content a potential customer will view before making a purchase. If it doesn’t fit their needs or answer their questions, they may leave the page before they buy. If you’re trying to grow your online coaching business, you can’t afford to have low-quality landing pages. Luckily, you can easily develop awesome landing pages with a tool like ThriveCart. ThriveCart is an online shopping cart tool that provides you with a number of tools to help increase sales conversions and optimize your cart as much as possible. Within ThriveCart, you can create powerful landing pages, upsells, coupons, and more to encourage more shoppers to buy – without needing to know how to code or develop. This can open a number of doors for small businesses without large budgets or experienced teams. Here’s an example of a ThriveCart sales page. This sales page is easy to complete, branded with the company’s logo, and showcases additional features to help the customer remember what they’re buying – and why they need it. ThriveCart also makes it easy to optimize sales pages for mobile devices, ensuring users get a great experience regardless of where they’re making their purchase. What are the Benefits of Using ThriveCart? ThriveCart is beneficial for a number of reasons. First, and most obviously, ThriveCart provides high converting landing page designs that can help you close more sales. When the sales process is too complicated to finish, shoppers will leave and purchase from a competitor who has created an easier process. But ThriveCart breaks away from these dull and difficult to complete landing pages, allowing you to create something your shoppers will really enjoy. ThriveCart is also great for memberships and subscriptions. With ThriveCart, the recurring payment for a membership will be set up with PayPal or Stripe, depending on what you choose. This means you don’t need to worry about losing those recurring payments if you ever choose to switch carts in the future. ThriveCart can also provide you with an account-wide snapshot of your sales, revenue, and most profitable product. These insights can help you better understand what is working with your audience and what isn’t. Finally, ThriveCart makes A/B testing easy. Properly A/B testing different landing pages can help you determine which design works best with your target audience. Through ThriveCart, you can easily set up can compare different pages to see which has the highest conversions. Another major benefit of ThriveCart is its price point. Unlike other landing page builders, ThriveCart is budget friendly, coming in at under $100 per month. For small businesses without a lot of room to spend, this is a great option that can easily help you get a great return on your investment. Where does ThriveCart Fall Short? While ThriveCart is a shopping cart tool, it isn’t ideal for multi-product stores. It can manage a few different items – like the courses or products you might have as a coach – but it isn’t the best tool for high inventory markets. If you’re looking to grow an ecommerce extension of your coaching business, you may want to consider something else. ThriveCart seamlessly integrates with a number of tools to help complete your sales funnel. In addition to connecting with Stripe and PayPal for easy payments, you can also add ThriveCart to your Active Campaign, ConvertKit, GetResponse, Ontraport, MailChimp, or Infusionsoft platform. ThriveCart also connects with LeadPages to create even more powerful landing pages. Don’t miss out on more sales and conversions because you don’t have the time or skill to create great landing pages yourself. If you’re looking for some assistance creating ThriveCart pages that convert more leads into customers, Automation Agency is here to help you out. If you’re already an Automation Agency client, go ahead and send us a task to begin your next project. If you’re not an Automation Agency, you can take our quick Right Fit Quiz to find out if we’re a good fit for your business.